Robert Engen. Strangers in Arms: Combat Motivation in the Canadian Army, 1943-1945. Montreal and Kingston: McGill-Queen’s University Press, 2016. Pp. 328. 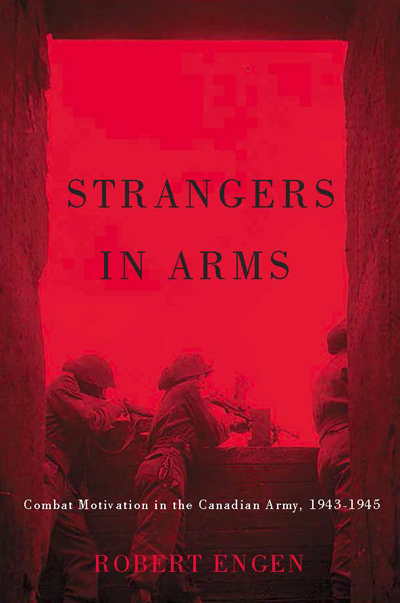 Robert Engen’s Strangers in Arms is both a continuation and expansion of his previous book Canadians Under Fire (2009). That it builds on this earlier work is evident in Engen’s addressing of Canadians Under Fire reviewer Dr. Howard Coomb’s observation that the first book failed to consider sufficiently the training regimens of Canadian soldiers as they prepared for combat during the Second World War. Yet Engen provides plentiful new material as he considers his subjects’ motivations, morale, and additional factors, providing further understanding of the Canadian infantryman in the Second World War. 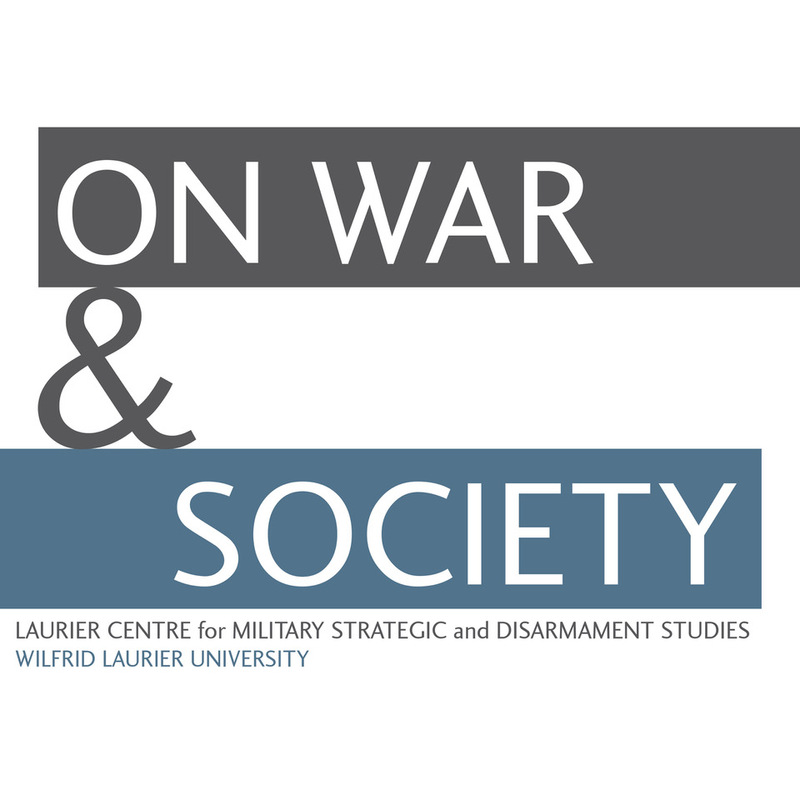 Students of combat performance will find much to reinforce the widely-held conclusion that soldiers—at least those from Western militaries, if not universally—have much in common when it comes to what underlies individual motivation and collective cohesion. Engen, however, also provides new insights, many, unsurprisingly, related specifically to Canadian infantry soldiers. The Canadians in the Second World War shared with their British, American, and Australian counterparts the tumultuous experience of preparing for combat during a massive expansion of their armed forces in which the country saw its numbers in military uniform increase more than one hundred-fold (p. 25). The Canadian infantry shared several characteristics with its counterparts in other militaries. For example, a Canadian soldier’s motivations lay less in nationalism or patriotism than commitment to comrades to his right and left as a unit moved forward in attack or readied to repulse the foe (pp. 15, 31, 119). As well, morale suffered more due to inactivity (p. 111), weather (pp. 110-112), and failures to receive mail (pp. 75, 108) than combat losses (pp. 174-75). 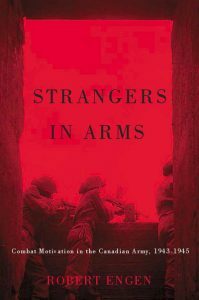 Other familiar points that Engen correctly concludes merit re-mention in Strangers in Arms include the value of informing men regarding their role in the larger operational context and a reminder that post-traumatic stress disorder need not be a product of combat experience alone (p. 207). It is his less familiar insights that provide the basis for both Engen’s title and several of his conclusions which are sure to cause future students of the soldier in combat to reconsider heretofore little questioned beliefs. Contrasting how Canadian tactical leaders responded to the challenge of maintaining sufficient manpower in infantry units with the German Kampfengruppen approach, Engen observes that it was the squad, platoon, and company levels at which Canadians consolidated survivors from understrength organisations, those returning after recovering from wounds, and others from non-infantry specialties, reassigning these men in the ever-present struggle to maintain sufficient combat power. Kampfengruppen, in comparison, tended to be ad hoc combined arms units the size of a company or larger (pp. 86, 156-57). It is from this phenomenon of moulding units from men unfamiliar with each other that Engen takes his title. He posits that the combination of a rapidly expanded military force, little retention of geographic coherency when initially forming regiments, and frequent reorganisation due to combat losses made Canada’s Second World War infantryman a stranger among his peers but a stranger who nonetheless fought effectively. He attributes that success to what he calls “swift trust,” the rapid development of faith in those who are fighting together despite a lack of longer-term intimacy (pp. 204-07). While it may be that creating units from cohorts with shared backgrounds, training, and service could result in more effective unit performance, Engen convincingly argues that such commonality is not essential to combat effectiveness at the small unit level. It is an argument which merits further investigation in future studies of performance under fire. Engen highlights two factors which go far toward explaining why swift trust found fertile ground in Canadian ranks. First was the notably fewer (though at times still quite high) casualties suffered by infantry non-commissioned officers above the rank of corporal as compared to those in platoon commander ranks (pp. 29, 186-87). Second is the army’s policy of “left out of battle” (LOB) in which key personnel (e.g., company seconds-in-command, platoon sergeants) were deliberately not sent forward with attacking units so that there would be personnel familiar with a unit and the nature of its operations when others fell to the enemy (p. 124). This is again a point worthy of consideration for those contemplating management of combat units in conflicts yet to come. The analytic approach behind such conclusions is noteworthy. Engen first ensures his readers are knowledgeable regarding the nature of Canada’s Second World War army and the factors making its soldiers unique. Theirs was—as it still is—a country with language and related cultural differences more pronounced than in most other Western Commonwealth contingents fighting on the Allied side (p. 248). French Canadians by and large fought in organisations where French was the predominant language just as those whose primary language was English found themselves in same-language units. Differences went beyond language alone, with French Canadian leaders tending to enforce discipline more strictly than their English-speaking counterparts. Some of Engen’s other findings are likely to raise the occasional eyebrow such as evidence that combined arms proficiency remained elusive throughout the war even as infantry drills marked a Canadian strength (pp. 40, 56, 63, 104) and a belief by Canadians in Italy that theirs was Europe’s “southern front” rather than a neglected one (p. 109). Shortcomings in this fine work number few and are minor in substance. Better editing should have reduced the too-frequent repetition of select findings. Readers need not be repeatedly reminded of the effects mail, inaction, and weather had on morale. That those effects were well established and shared on different battlefields are points understood thanks to the first or second of their several mentions. So too are cases of highlighting the Canadian belief in the near sacredness of the volunteer vice conscription soldier. More inquisitive readers will here and there question whether the author assumes a bit too much (as in the case of what motivated two brothers to join the ranks, p. 38). Elsewhere the logic oversteps, if ever so slightly. While any “absence, desertion, and other forms of combat refusal” are certainly cause for concern when found in infantry ranks, to imply that leaders gave special emphasis to riflemen’s absenteeism because they were at the sharp end implies that losses in other ranks less affect combat success, logic not a few military leaders would debate (p. 113). The book’s index is unfortunately little more than a placeholder; too many key references and even the author’s fundamental “swift trust” are not to be found therein. The last is the more unfortunate because Engen’s research effectively mines so broad a range of available material. It shares something of the ambition and rigour characteristic of Samuel Stouffer’s highly regarded studies of the Second World War American soldier. So too, Engen covers ground in common with S.L.A. Marshall’s valuable but significantly flawed Men Against Fire such as the influence of individual relationships in infantry units. Like Anthony Kellet’s Combat Motivation, Strangers in Arms seeks to improve our understanding of soldier motivations. And, shared with this reviewer’s own consideration of American soldier performance in Reading Athena’s Dance Card: Men Against Fire in Vietnam, Engen recognises that only through diligent study of those who experience it can one understand the human condition in combat. Similar to these works but unique thanks to its focus on the Canadian soldier, Engen harvests vital material from wounded officers’ replies to questions completed soon after their time on the frontline and censors’ summaries of soldiers’ revelations to provide key underpinnings to Strangers in Arms analysis. These find valuable complements in the restrained use of regimental histories and select other materials as the author effectively walks around the table to view his subjects’ experiences from multiple perspectives. Adroit reference to official records further complements these to provide a concise overview of Canadian soldier demographics as presented both in the book’s main body and several appendices. Any historian seeking to understand the minds and motives of combat soldiers faces innumerable obstacles. Those conducting post-event reviews years after a conflict lose the rich ore of immediate memory. Others mining contemporary materials as does Engen find they can access only select veins of that ore; for example, it appears only officers in hospital were surveyed for their views on Canadian soldier performance in Second World War Europe, theirs being a group likely to view topics such as the effectiveness of Canadian leadership differently than might other ranks. Nevertheless, Engen does much to push those obstacles aside in his efforts to better our understanding of his subjects and, by extension, soldiers of other countries. It is an understanding of interest to military historians, those finding themselves responsible for manpower and training policy, and anyone pondering the motives and experiences of homo sapiens at war. 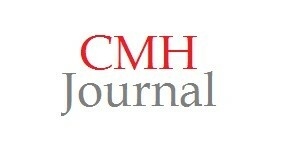 For example, see Samuel A. Stouffer, et al., The American Soldier: Combat and its Aftermath, vol. 2 (Princeton, NJ: Princeton University Press, 1949). S.L.A. Marshall, Men Against Fire: The Problem of Battle Command in Future War (Gloucester, MA: Peter Smith, 1978). Anthony Kellet, Combat Motivation: The Behavior of Soldiers in Battle (Boston: Kluwer-Nijhoff, 1982). Russell W. Glenn, Reading Athena’s Dance Card: Men Against Fire in Vietnam (Annapolis, MD: Naval Institute Press, 2000).